Only Organization Administrators and Project Maintainers can transfer projects to another organization. Sometimes, you may want to give ownership of a project to another organization. Go to that project's settings page. Scroll down to the Project Actions section and click on Transfer Project Ownership. In the popup, type in the slug of the organization you want to transfer your project to. For example, the Transifex organization lives at www.transifex.com/transifex/. 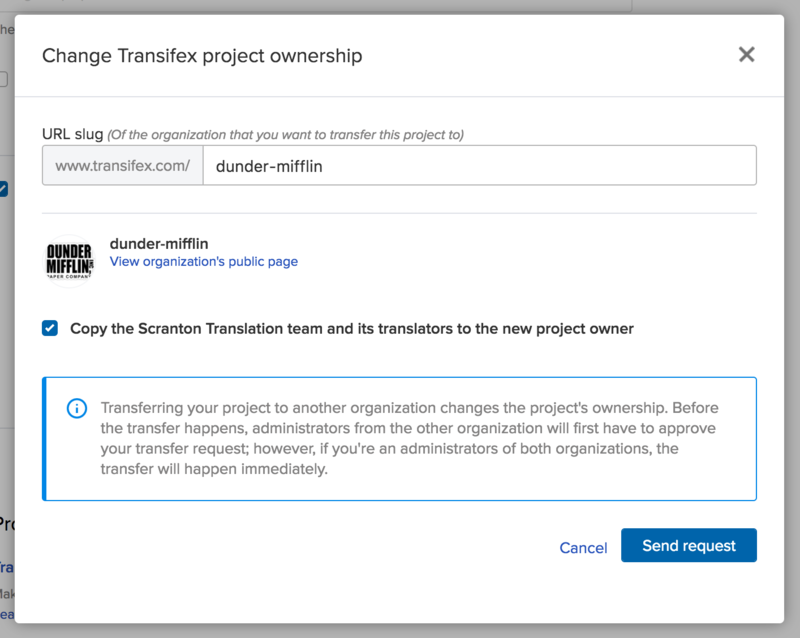 If you wanted to transfer a project to the Transifex organization, you'd type "transifex". Choose whether you want to copy the translation team assigned to the project over to the new organization, then click Send request. Before the project transfer happens, Administrators from the other organization will first have to approve your transfer request; however, if you're an Admin of both organizations, the transfer will happen immediately. By default, the team translating the project does not get transferred. A new team will be created in the organization that you transfer the project to, and it'll have the same languages as the languages in the transferred project. But if you selected the Copy the team and its translators to the new project option, then the whole team, including the translators, will be copied over. All translations will be preserved.